When I first came to Indonesia, I was terrified of the pasar (market). It was loud, crowded, hot, and full of entirely unfamiliar and not always pleasant smells. And in Indonesia, unless you are at the rare stall that uses harga pas (fixed price), you are expected to menawar (bargain), and I am terrible at haggling: I’m never aggressive enough, and always end up either stubbornly walking away on the principle that I should not be grossly overcharged just because I am a foreigner (therefore empty handed), or submitting to being charged harga bule (the foreigner’s price) (therefore with damaged pride). Approaching the market, surrounded by bentors, as it always is. Throughout my first grant, I rarely had any need for the pasar, as I ate all of my meals at school and wasn’t overly fond of berbelanja (shopping), generally speaking. Every so often, I stopped by the fruit stalls that were near the entrance of a market I would pass on my way home from school, and bought batik fabric (the one thing, other than books, I do enjoy shopping for) from the market a handful of times, but for the most part, I avoided them. This year, I live right in the middle of two of the main markets in town. Pasar Selasa (the Tuesday Market) is perhaps a ten minute walk from my house, and Pasar Rabu (the Wednesday Market), is a mere five. And both semesters, my class schedule has allowed me a free morning on at least one of these days. Since I am on my own for meals this year, and wanted to do some of my own cooking—instead of just eating at the warung near my house—without paying ridiculous grocery store prices, I decided I would need to brave the market. The tarps give everything in the market a warm orange glow. For the first few months, market day was my least favorite day of the week. I would wake up early, knowing it would take me at least a half hour of hovering in my front room to work up the courage to actually walk out the door and head to the market. Market day was a day of dripping with sweat under the make-shift tents, no matter how close to opening I arrived. Market day was trying to get fair price for the vegetables on my list without having to go to too many sellers. Market day was trying to weave through the crowd amidst the cacophony of shouting (in Indonesian mostly, but the occasional English, too)—“Ayam! Ayam! (Chicken! Chicken!) Miss! Cantik! (Beautiful!) Ikan! Ikan! (Fish Fish!) Mister! You like fish?”—as I tried to find the one tempe and tahu (tofu) seller that I had been promised was at the back of the market. Some people are good at this kind of chaos. I am not one of them. Still, I kept going, every week, week after week, month after month. I told myself the fresh vegetables were worth it (and they absolutely are), and refused to give up and only eat out. And slowly, market day became a bit less intimidating. My tempe/tahu lady on the right, and Mr. Kopi on the right. They’re always teasing one another, and I ended up capturing it when I tried to take a picture of them. By this point, I am well-known at Pasar Selasa (Pasar Rabu is no longer as convenient because of my new school schedule). I have my favourite sellers from which to buy various delicious, fresh vegetables and fruits, and they are always telling me what is in season and how the weather is affecting various crops (it has been particularly dry this year, and the manner in which they lament this fact takes me back to my own farming community in New York). The man I buy eggs from asks me about my classes. The fish sellers know by now that I do not buy fish, and have ceased to try to tempt me with their fresh, still-flopping wares, except occasionally in jest. There is a man who sells coffee next to the only stall that sells tempe/tahu, and it has become a running joke for him to try to convince me to buy coffee from him, even though I always tell him that I only drink tea. I didn’t make it to the market at all in January (except for the occasional quick trip to get eggs for breakfast), because I had gotten busy, and when I finally went for a full-fledged shopping trip in early February, my tempe/tahu lady actually asked me if I was okay: after not seeing me for so many weeks, she thought maybe I was ill; I smiled warmly at her kindness, and noted to myself that I wouldn’t have this element of community if I had given up on the market experience entirely. Though I feel I have gotten much better at the ins and outs of market life in Indonesia, I have yet to master it, and I look forward to my relaxed, quiet farmers’ markets at home. But nonetheless, the pasar has become a key part of my life here, and I have come to find joy in the chaos. 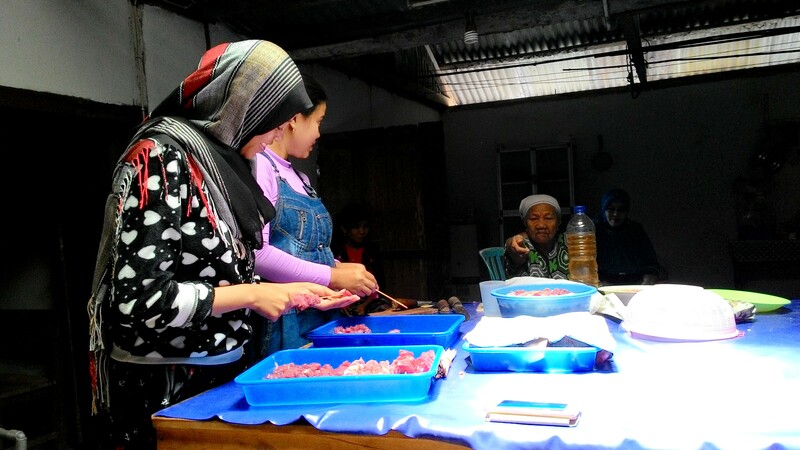 While I am not a vegetarian, I find that cooking meat for one person is far more work than it is worth, especially with only a single burner in which to cook anything, so I tend to only eat meat when I go to a warung.